After the NCAA Men’s Basketball season, the San Beda Red Lions will be participating in the track and field competition. That’s how it seems after they demolished the University of the East Red Warriors, 94-72, in their Filoil Flying V Premier Cup opener yesterday at the Filoil Flying V Centre in San Juan. Full court press? What full court press? Teams wanting to beat that style of defense that will also be employed by La Salle and Adamson this coming season should have watched how San Beda shredded UE’s vaunted pressing style by rebounding the ball and moving the ball up quickly even before the defense could set up. The halftime score read had the Red Lions leading, 52-33. The highest the lead went up to was 25, at 79-54, at the seven-minute mark of the third period. Fastbreak points: 20. Turnovers, 8-13, in favor of the men in red. By matches end, they had 31 fastbreak points. The shot a scorching 51% from the field and 44% from the three-point arc. If they converted more of their free throws (13-28), the lead would have been much higher. What UE should have done was jam the outlet and cover the guards who were more often than not already crossing the halfcourt line with the ball barely through the hoop. The Red Warriors did exactly that but on occasion, San Beda still had those all alone lay-ups. Or should we say run. If one has followed Jarin’s career of coaching, he would note his team’s mania for defense and the need for speed. “Speed kills,” Jarin noted of his former teams. I remarked to Jarin that at some points during the match, he fielded what seems like five guards with some who are swingmen. “Golden State basketball,” I threw in. Jarin is hesitant to say he is a copy cat. “You know the kind of unconventional lineups I’ve played through the years,” he reminded. While in Ateneo, he had slotman Jay Javelosa bring up the ball sometimes (although Javelosa despite his height played point guard in the Ateneo Grade School before coaches switched him to the five because of his height) with Kiefer Ravena at the four, with Chuckie Dumrique and Von Pessumal in the backcourt. That allowed them to quickly get out on the fastbreak dismantling foes within seconds. “He’s a self-proclaimed mad scientist,” described Pessumal of his former coach. At one point during the San Beda-UE match, Jarin put the unit of Dan Sara, Ranbill Tongco, Javee Mocon, Jerramer Cabanag, and Davon Potts on the court. After one outlet pass to a streaking Sara who didn’t have any Red Warrior within a mile of him, Potts yelled, “Touchdown!" “Defense is the key. And that defensive rebound to get out offense going,” pointed out the second year coach. Fortunately, Mocon was there. While with the Red Cubs, Mocon played a variety of positions played anywhere from the two to the five spot especially when then SBC slotman Arvin Tolentino was on the bench. He was their third best rebounder after their centers Donald Tankoua and Arnaud Noah who finished with 10 and eight boards respectively. 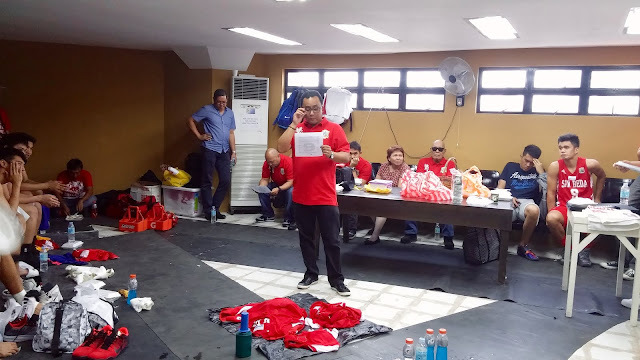 “What we have is a smaller line-up but one that is faster, deeper, and more athletic,” added SBC team manager Jude Roque who also pointed out that the team’s strength and conditioning program has been just as important. Their offense was never static. Always in perpetual motion confusing UE and at times creating mismatches. They had snipers line-up around the arc at all times ready to make the opposition pay for their confusion. By match’s end, Jarin, inside his team’s locker room pointed out that shooter AC Soberano was named the game’s best player for scoring 19 points (5-8 three point shooting, 2-2 on the break, and two free throws) despite not scoring a point in the second half. “It underscores our balance that anyone, at any given time can score and explode." Potts, Mocon, and Sara led the second half scoring parade for San Beda. “The interesting thing is to see how we can sustain this kind of play." Before the Red Lions broke the huddle, Jarin asked his team one last question. “You all know me by now. What am I going to do tomorrow?” San Beda was playing its second Filoil Flying V Premier Cup match for a second straight day, this time against Lyceum of the Philippines.